[New for 2010, now retired] During my excited rant about all the new Spring products I saw at Shaws the other day, I mentioned that I brought one of the new ice cream sandwiches out of the store with me. Well, here is my fun new friend. What can I say, I'm a huge sucker for cookies and ice cream, they just go so well together. I love creamy ice cream, I love crunchy cookies, and I really love eating them both at the same time. 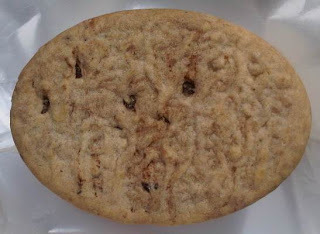 The chocolate chip cookie dough version is described as cookie dough flavored light ice cream with chocolate chip cookie dough pieces between chocolate chip cookies. I've always been a big fan of single serve treats, and if you can bring me a quality treat that's not immensely unhealthy, well then, sign me up. Ok, I wasn't expecting that, it's egg shaped! weird. To be honest, at first I thought there were 4 in a box since it was a square box, so when I realized there were six in the box, I couldn't help but wonder why the box was square. Well, now I know why, it's because the treats aren't the shape you'd expect. 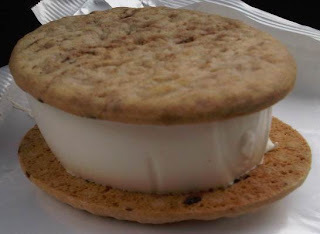 I guess they are meant to fall between a rectangular ice cream sandwich and your typical round cookie ice cream sandwich. I know it doesn't effect the taste, but it did confuse me for a second. Whoa, now that's a lot of filling. Again, I'm a little thrown off by appearances since the ice cream doesn't go edge to edge. It shouldn't affect the taste, but your brain starts getting a little afraid of why your treat isn't perfect. Well, perfection is relative, and taste is everything, so DIG IN! Interesting, very interesting. The cookie is pleasantly crunchy. It doesn't taste exactly like a typical cookie, but it's definitely an enjoyable cookie wafer hybrid. It's not super chocolaty either, its cookie dough we're going for here, not chocolate cookie dough. The ice cream? 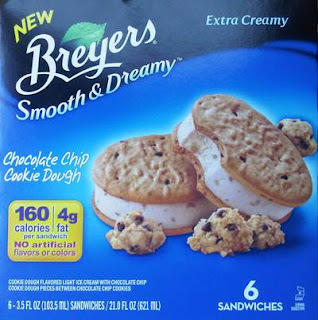 Pleasantly creamy as well, Breyers did a good job with the texture here. The flavor isn't real strong, but it doesn't need to be because we have the cookies to take care of that. We do have one problem though. Look at the picture I took: clean white ice cream, nothing in it. Now look at the box image again: cookie dough bits in the picture and the description. I have now had 3 of these things and have yet to find a single bit anywhere. Thankfully they are still enjoyable, but you have to wonder if they could be even better. I do wish there was a bit more chocolate going on here, whether it was in the cookies or in the ice cream, but I'm still happy and I've been having fun snacking on these relatively healthy-ish treats at work. Note: Breyers has contacted me and said there definitely should have been cookie dough bits in my ice cream. In fact, the ice cream really should be edge to edge. So we're going to try and arrange a second taste test from another location (gotta check those MFG codes to make sure I don't get a box from the same day). I definitely appreciate these treats, so I'm curious to see if they get even better. I love how they angle it on the box because you really can't tell! I'm still enjoying these though, and I'll be happy to pick up another variety on my next lunchtime run to the store. I tried this tonight and there were no cookie dough bits in mine either! I don't find cookie dough bits, and the ice cream does not go edge to edge on mine, either. I thought that was the way it was suppose to be. Since it's not--then they have a quality control issue. No cookie dough bits in mine, the cookie was soggy and didn't taste like chocolate chip cookie but like those skinny cow 'cookies', and the ice cream was even LESS edge to edge than yours! I felt like the cookie was completely misrepresented on the box, and tasted just like the just-okay Skinny Cow sandwiches (and thus nothing like a choc chip cookie sandwich.